Chili hot dogs (or “chili dogs” or “chilidogs") and chili hamburgers (or “chili burgers” or “chiliburgers") continue to be popular. 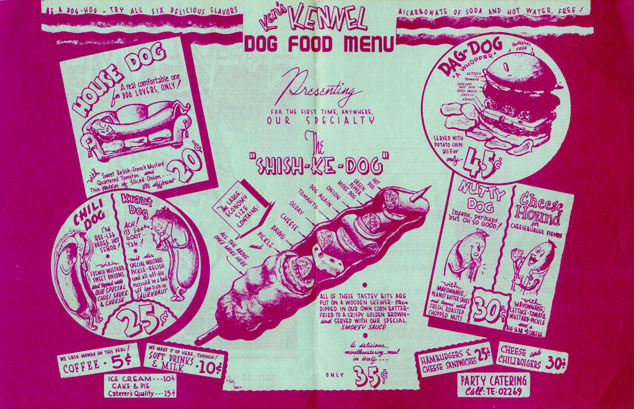 No one knows exactly where or when chili was added to hot dogs and hamburgers, but the foods became popular from the 1930s and 1940s, especially in California. Atlanta’s Greeks, the men who control the “hot dog” industry here, have old Julius Caesar and his compatriots skinned two ways from Sunday in the gentle art of lifting the coin. In five years gone by they have made the Sherman act blush with shame. They are the compeers of every other nation when it comes to forking “hot dogs” and spreading the mustard, chile, and the sauerkraut. If you have a hungry crowd of young people to feed some cold evening, ply them with chiliburgers. These big chili filled buns disappear in a hurry at a tableful of husky appetites. Broil chopped bacon. Drain and cook onions and celery in the bacon drippings. Add meat and seasonings and brown well. Add remaining ingredients and simmer about 30 minutes, or until rather dry. Serve between large buns with coleslaw and dill pickles. Chili hot dogs are all three, Petunia! Tuck heated frankfurters into toasted rolls—pour hot canned chili over them—and serve plenty of paper napkins to catch the drips! hot dog a real he-man favorite. Chili Weiner_is a popular fall and winter specialty. It is made by placing a frankfurter in split bun, covering it with chili sauce and (if desired by the customer) chopped onions. Chile dogs were served to the guests by Miss Brown, who was assisted by her mother and her sister. Teenagers will be delighted with another special after-the-party supper with baked bean sandwiches, banana grape sparkle, chili dogs and a hearty party macaroni salad. There are chile dogs at the Beach Club and Leaky Dogs at Lido Isle Club. In a large skillet, lightly brown meat and onion in hot fat. Add chili, frankfurters, soup, chili sauce, and salt. Heat thoroughly. Add green pepper. Garnish with diagonal cuts of frankfurters and ripe-olive slices. Makes 8 servings.